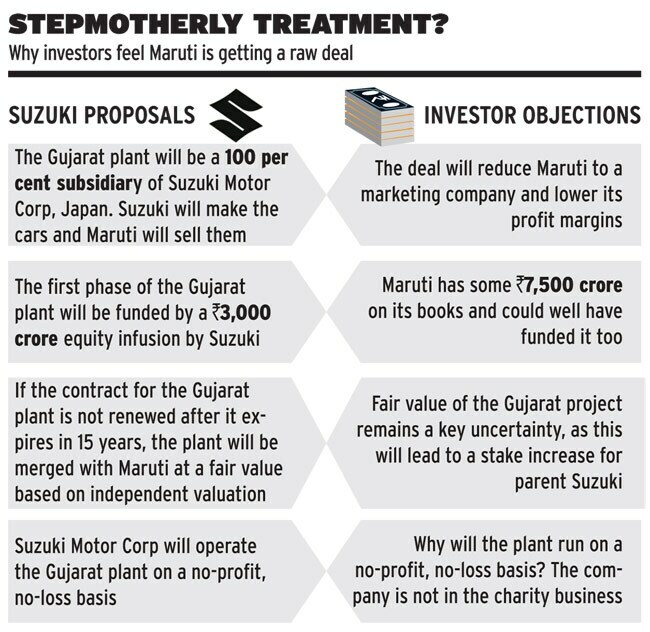 Why Suzuki's decision to take control of the upcoming plant in Gujarat has angered Maruti's investors. Controversies seem to follow the country's largest carmaker Maruti Suzuki India Ltd. In 2011, it saw much labour unrest leading to a shutdown, which in turn prompted the company to set up its third unit, not in Haryana where the first two were located, but in Mehsana district of distant Gujarat. It is the third plant which has raised the latest controversy, ever since the company announced in January that the plant would be set up, not by Maruti, but by a subsidiary of its Japanese parent Suzuki Motor Corp (SMC). Initial annual production capacity of the Gujarat plant. SMC will initially invest Rs 3,000 crore in the Gujarat unit, to be named Suzuki Motor Gujarat, and all cars made at this plant will be sold to Maruti at cost plus some profit, which, in turn, would be used to fund the plant's expansion. But a group of seven large institutional investors in Maruti - including HDFC AMC, Reliance Capital, ICICI Prudential, SBI Funds Management and others - have raised concerns about the nature of this transaction. State-run insurer Life Insurance Corp, which has a 6.93 per cent stake in Maruti, also sought clarifications. Maruti was quick to come out with clarifications on February 28, but these failed to allay the fears of investors. After the January announcement, Maruti's stock fell over six per cent until March 4. So, what are the investors upset about? The Gujarat plant is expected to reach a production capacity of 250,000 units a year by 2017 funded entirely by SMC. Subsequent investment in the plant, projected to reach a production capacity of 1.5 million units a year, will come from the net surplus of selling cars to Maruti, fresh equity infusion by SMC and the depreciation amount available with the subsidiary. Although Maruti says the price at which cars will be sold to the company by the Gujarat facility will be less than the dealer price it currently charges, and the Gujarat plant will run on a no-profit, no-loss basis, there is no clarity on the amount of surplus that will be charged from the automaker. The company only says the surplus amount (generated from Maruti) will be determined by market conditions. "This is a grey area for investors. A higher amount will result in lower profitability for the Indian company," says Mitul Shah, analyst at Karvy Stock Broking. Investors are particularly uncomfortable with Maruti's profits being used for the Gujarat plant, a company 100 per cent owned by SMC, and the change in Maruti's profile from a manufacturing company to, at least partially, a trading outfit. Maruti's annual capacity is some 1.5 million units at its two Haryana plants. 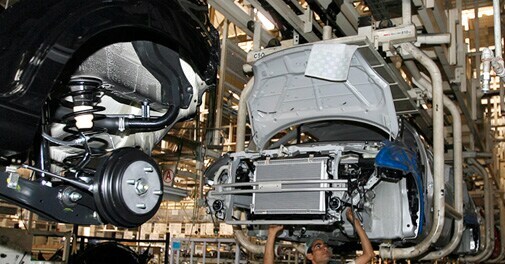 By the time the Gujarat unit reaches full capacity, Maruti will be hugely dependent on it to meet its needs. Analysts say Maruti can command higher profit margins and better control over production if it remains a manufacturing company. "We source nearly 70 per cent of our components from vendors. 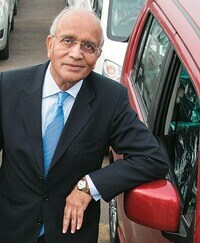 Our content is merely 30 per cent which also includes interest, depreciation and profits," says Maruti Chairman R.C. Bhargava. Typically, trading companies in the auto sector command lower profit margins of two to five per cent compared to 10 to 15 per cent by manufacturing companies. Priceearnings multiples of trading firms are also lower than those of manufacturing companies, which could lead to an erosion of Maruti shareholders' wealth. "In future, Maruti will have to depend on Suzuki for incremental production. It is unclear what products will come out of the Gujarat facility and, if a slowdown comes, how the capacities will be utilised," says an analyst with Kotak Securities. Maruti's institutional investors are now planning to approach market watchdog SEBI, while the management is meeting with investors and analysts. Investors are sceptical about Suzuki investing money in Gujarat when Maruti has some Rs 7,500 crore of cash reserves on its books. Suzuki says its funds in Japan are generating lower returns than Maruti's in India. It is, therefore, better for Japanese funds to be invested in the Gujarat plant. "If Maruti is not investing in the Gujarat plant, it must return the excess liquidity to shareholders in the form of higher dividend," says a note by proxy advisory firm Institutional Investor Advisory Services (IiAS). "Maruti's investment portfolio has generated returns of around seven to eight per cent over the past three years, which is significantly lower than the company's return on capital employed (12-15 per cent)." However, a senior Maruti official says the decision by Suzuki, which owns a 56 per cent stake in the Indian automaker, will help Maruti increase its profitability in the long term. "In our industry, manufacturing is not going to give us an edge over the competition. Competitive advantages come from new product development, building new technologies and creating marketing infrastructure. Maruti's management needs money in hand to meet such requirements," says the official. The timing of the announcement has also caused distrust. Analysts say the deal came just two months before the new Companies Act 2013 comes into force from April 1. Under the new rules, such related-party transactions will require approval from a majority of minority shareholders. Investors say barring the Ambuja-Holcim deal where approval from minority shareholders was sought, minority shareholders in India get a raw deal. But some analysts agree with Maruti that Suzuki's investment will benefit the company given the slump in the automobile sector. Maruti's sales volume growth has been flat for the past two years. "The company needs at least 15 to 20 per cent volume growth on a CAGR basis to fund the entire capital expenditure in Gujarat. A 1.5-million-units-a-year plant would require Rs 25,000-30,000 crore. The growth outlook is not expected to drastically improve going forward. It might not have been possible for Maruti's future cash flows to completely fund this expansion," says Nishant Vass, research analyst with ICICI Securities. How can the controversy end? The company has two options: to put the proposal before minority shareholders, or go back to the drawing board.